György Kurtág, when asked to describe his music. 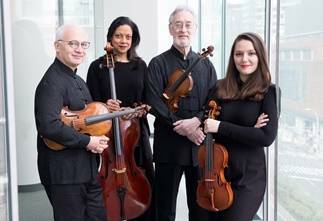 Yet somehow, their soul, that ineffable lyric singing voice, whether in their iconic Bartók or their down-to-earth Dvorák has remained always...well, the Juilliard String Quartet. They are not glued to classics or adventures, but embrace all with (what can only be called) joy. That joy was evident in all three works at the 92nd Street Y last night, for one felt they conveyed Haydn’s inspiration, Kurtág’s happy invention, and Dvorák’s ineffable charm. The Haydn Opus 76 quartets essay a universe of emotions, and this, despite the mesto direction (“sad”) for the second movement is not a personal testament of misery. That cantabile movement, longer than the other three movements played together, was hardly sad under the Juilliard String Quartet, but perhaps, the start was too ebullient to give it more than a glowing touch. That, glow, in fact, was imparted by the newest member of the quartet, Greek-American first violin Areta Zhulla. Was she taught, did she inherit, was there something in the Hellenistic genes that Leonidas Kavakos, who had performed 24 hours before, bestowed upon her? What a tone she has! When she was in the upper ranges, one could only wonder at the shimmering beauty she possessed. And yes, the Juilliard String Quartet a single ensemble. But bless them for offering such singularity for each of their players. The Haydn was a solace. The following Kurtág was perhaps enigmatic to some of the audience, yet again the Juilliard offered, for each aphoristic Musical Moment its own personality. The opening was harsh, yet not grating, as if the composer wanted to draw our complete attention. The following Footfalls is hardly Debussy’s Steps in the Snow. It is based on Samuel Beckett, and also based on a Hungarian poem (“No one comes, as if a woman were coming, on a dark stairway, trembling, running...”), and the ensemble played it with questions, with trembling. The last four gnomic movements were deliciously capricious, they echoed Kurtág’s beloved Bach, and the harmonics were used to emulate, not imitate his equally beloved teacher, Messiaen. For any in the audience who had been lulled by the Haydn, who feared the Kurtág, these six works were bijoux, jewels which, like electrons, came from nothing, glowed, disappeared. Magical. The Juilliard was joined by a musician of equal status for Dvorák’s irresistible Second Quintet. Yes, it was glorious–but it took a full opening movement to fully love it. So familial was the Juilliard Quartet in the first half, that Marc-André Hamelin seemed to dominate the Allegro start. I doubt if this was Mr. Hamelin’s fault. He is, of course, a musician who could dominate a Mahler symphony! And he attempted to be part of the group. Yet inevitably, the piano sound was alien to what we had heard before. The revelation became soon clear enough that this was not exactly an ensemble work. 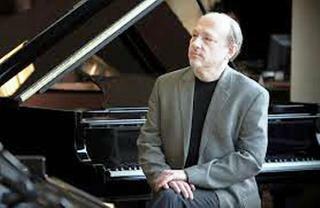 It was a dialogue between piano and instrument, and Mr. Hamelin had no need to suspend the exuberance. The result was a wondrous tome of moods and sentiments. The epic songs of the first movement, the dances and delights of the last two movements. The third is called a “furiant” but the finale was plainly the furious one in speed, yet not fast enough to blur the elements. The second movement, the Czech Dumka gave off tenderness, eloquence and, yes, sheer joy.